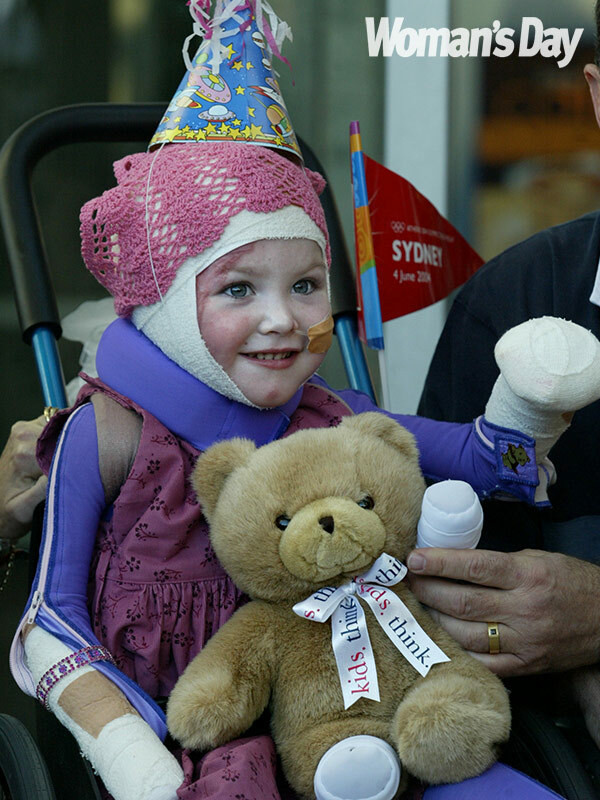 Australia’s brave little bandage girl has blossomed into the belle of the ball. Sophie Delezio's smile couldn't be any sweeter as she stands tall in an elegant floor-length dress and sky-high heels. Thrilled to bits with "all the girlie stuff" – her bright lipstick, glittery eye makeup and a stunning wrist corsage of hot pink roses, the year 12 student admits she's well and truly caught "formal fever", especially when a giant stretch limousine pulls up outside her driveway. "The night is finally here!" trills an excited 17-year-old Sophie, who has been getting ready at her home, surrounded by her closest buddies and their parents. Now the countdown is on – with the snazzy-looking bunch soon to be on their way, Sophie is dizzy with anticipation, rocking a dance step or two on the arm of her date, as she farewells her family. "I'm so happy – this is about celebrating with my friends, and the best time of my life so far!" she says. Her senior formal obviously feels like a major milestone for Sophie – just as it will spark emotion in people near and far who have watched her grow up in the public eye. Many still remember her as the bandaged little girl who kept smiling through adversity and beat the odds after two near-fatal childhood accidents. The first occurred nearly 15 years ago when a car crashed into Sophie's childcare centre and burst into flames on top of her, resulting in burns to 85 per cent of her body and costing the then-two-year-old most of her skin, right ear, the fingers on her right hand and both lower legs. Still in and out of intensive care two years later, she was hit by a car on a pedestrian crossing and left with bleeding on her brain and other trauma. But Sophie has always powered on. With her brother Mitchell, mum Carolyn and dad Ron. Despite continuing pain as a teenager, she never says "What if?" but attacks each day as though she has no disability. This includes "being a super-organised freak" and doing all her own washing, working two to three shifts a week at her local Coles and training and competing in rowing regattas. Plus, she is mulling over plans of attending university next year in the UK. "In my mind I'm not 'Sophie the girl with no legs' but someone completely normal," she explains. "I think of myself as Sophie the chatterbox, the socialite, the girl who loves a good hamburger and enjoys each day as much as she can." Unfazed by HSC study and looming exams, her famous joie de vivre propelled her onto her school's formal committee. Sophie is proud of the event she helped produce – from the decorations to the class awards and theme of "A Night To Remember" – while still finding the time to pull her outfit together weeks in advance. Top of the to-do list, of course, was the dress, which she found online in record time for the bargain basement price of $29. "At first I was obsessed with red, my favourite colour, but as you can never be too sure of the true shade of that on a screen, I went with light grey instead," she says of her "perfect" halter-necked and fishtail-skirted gown, which features intricate lace detail down the back. Sophie always makes time for faithful assistance dog Willow. To accommodate her evening shoes – 10cm-high beige sandals, also bought on sale – Sophie wears her prosthetic legs fitted with adjustable soles. As usual, she plans to soldier on despite any discomfort on the dance floor. "I wear my legs way more than I'm supposed to, anyway, because I'm stubborn and I value my independence," Sophie shrugs. Although the P-plater needs prosthetics to drive, as the only modification to her car is an electronic knob on the steering wheel, it's standing up in them on a continual basis that causes her most grief. Sophie winces as she details the consequences of seven-and-a-half hours spent in the mosh pit during last February's Ed Sheeran concert – the most she has ever used her legs. "I couldn't wear them at all for the next week, and the wound in my right thigh was so deep it took four months to heal. But I did end up with Ed's guitar pick that he threw into the crowd, and that made me so happy I bawled my eyes out on the spot," she reveals. "It was agony later but definitely worth it – I would go through it all again 1000 times over!" The owners of Hummerzillaz found Sophie's story so inspirational they gifted her and her friends a limo for their special night! Sophie is also pleased she suffered for thicker hair in her pre-teen years. During a painful series of operations, a section of her scalp was stretched with a tennis ball-like object to allow hair follicles to be transplanted. The resulting extensions she can support thrill her on a daily basis. "Never mind how much it hurt at the time!" says Sophie, who loves looking in the mirror and seeing the long mane she has always longed for. After musing over styles on Pinterest, she reluctantly decided an updo was too hard and asked her "genius hairdresser" instead for fresh extensions, a side-plaited fringe and the rest of her brunette tresses to curl over one shoulder. Handsome Chace Pilkington was another formal accessory to delight Sophie. She makes it clear there is no romance between the pair, as her "bestie" and Bradfield College schoolmate stands close by her side only to make the perfect "fake date". But they adore each other, she admits. "We are both outgoing, have the same interests and most classes together, and we love each other's dogs – always the sign of true friendship." "Bestie" Chace was the 17-year-old's date for the night. As the couple prepare to join the rest of their group in a stretch Hummer ride over the Sydney Harbour Bridge to the formal venue, Sophie ducks off quickly to her bedroom. On her mind is a special Sophie problem. Her custom-made right ear is missing – "not lost, but temporarily misplaced somewhere, as usual" – and she wants to have one last look before they leave. Also done in double-quick time is a family photo with parents Ron and Carolyn, and big brother Mitch. After Ron relaxes an excited Sophie with his dad joke routine, they all tell her how beautiful she looks. A photo of this special moment will be given to Dr P – the surgeon who saved Sophie's life during those traumatic times in 2003. Dr P still sees her regularly, performing her operations as well as monitoring all progress. "I love that guy, and I hope this will be a very proud moment for him, too," Sophie smiles. Where does the time go? From the little girl that captured the nation's heart to the independent year 12 student. "Going to the formal has been my dream, because it isn't just about the end of school but a launchpad into the world. It means I've made it to here," she says. "But it's a little sad too, because in just a few hours it will all be over. We'll be off somewhere having greasy burgers in our formal dresses, making memories." To help support critically injured children like Sophie, visit Day of Difference.